With your quality of life in mind, we’ve included premier amenities and refined upgrades in every apartment home. Select your ideal floor plan and discover a new level of enjoyment and convenience at Shadowbrook Apartments. We can’t make chores any more fun, but we can certainly make them easier with easy-to-clean plank floors in the main living area, new stainless-steel dishwasher, and walk-in closets with extra storage space. When the day is done, your living room is the perfect place to kick back and relax. Spectacular mountain and city views are visible from your private balcony or patio. On cold evenings, keep warm in front of the fireplace, which is available in select units. Are you tired of carrying your laundry back and forth to a community facility? You’ll love the utility room with washer and dryer connections, included in every floor plan. Shadowbrook Apartment’s most desirable feature is that, once you drive onto the property, everything you could need or want in an apartment community is right outside your front door. We have something for everyone for year-round recreation and enjoyment. When you’re craving a relaxing day in the summer sun, the sparkling swimming pool is the perfect place to cool off. In winter, you’ll love coming home after skiing or work and soaking in the enclosed hot tub. Visit the management team in the clubhouse and take advantage of the practical amenities inside. The business center with internet cafe and work spaces make it easy to get work done from home. If you choose to not have a washer and dryer in your apartment, there’s a modern laundry facility for your use. Getting exercise is easy in the clubhouse’s fitness center, with state-of-the art cardio and weight equipment. If you prefer to exercise outside, you can join your neighbors on the soccer field for a friendly match or go for a jog around the property. 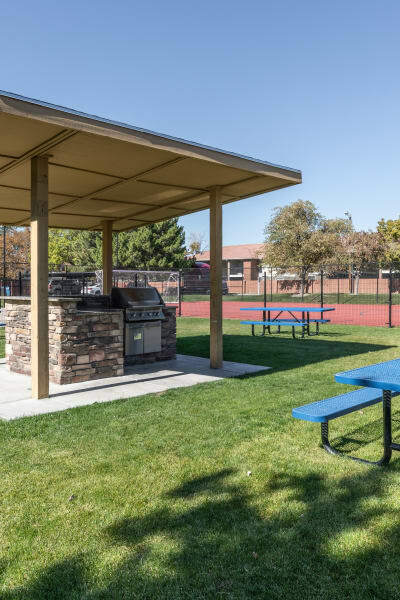 Your four-legged family members will love their new pet-friendly community, on-site dog park, and charming walking trails, all with mountain views. The best way to experience all of Shadowbrook Apartment’s amenities is to see them in person. View the photo gallery for a glimpse of the community and then call us to schedule your personal tour.